The AID Demonstration program provides funding as an incentive for eligible entities to accelerate the implementation and adoption of innovation in highway transportation. The AID Demonstration program is one initiative under the multi-faceted Technology and Innovation Deployment Program (TIDP) approach providing funding and other resources to offset the risk of trying an innovation. The new Notice of Funding Opportunity (NOFO) was published on September 1, 2016, continuing the AID Demonstration program under the Fixing America’s Surface Transportation (FAST) Act (Pub. L. No. 114-94). Applications for the AID Demonstration program are being accepted under Opportunity Number FHWA-2016-21063 through Grants.gov. 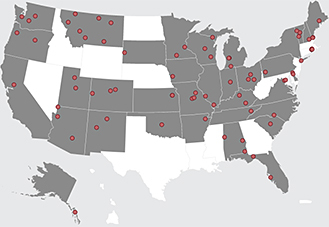 More than $8.4 million in grants from the Accelerated Innovation Deployment (AID) Demonstration program will fund innovative projects in Arizona, Florida, Illinois, Iowa, Minnesota, New Hampshire, New Jersey, Oklahoma, and Utah. The grants will be used to improve safety, mobility and project delivery and will encourage similar innovations nationwide. The Dickinson County Road Commission is sharing their experience with hot-in-place (HIP) recycled pavement and warm mix asphalt (WMA) innovations as part of their Accelerated Innovation Deployment (AID) Demonstration project on Pine Mountain Road – Westwood Avenue in the city of Kingsford, Michigan. Information on awarded AID Demonstration grant funding. New applications for the AID Demonstration program are now being accepted through Grants.gov (search for Opportunity Number FHWA-2016-21063). While “Application Instructions” are available for download, please refer to the NOFO and Notice of Correction to learn about the selection criteria, application requirements, and evaluation process.